Plus fun footwear and gloves to buy now. Cosy slippers are one of the best things about winter. We've all heard the saying 'cold hands, warm heart'. 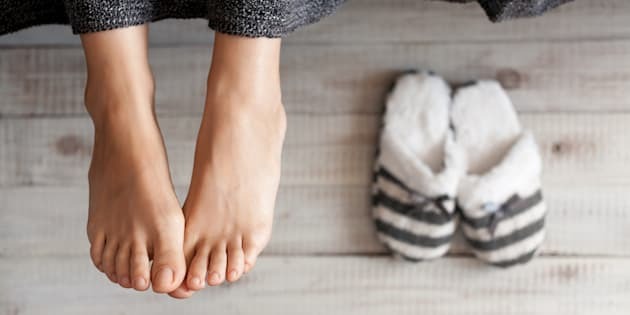 Having freezing hands and feet is part and parcel for some people during the colder months, though the good news is that cold extremities, though a little uncomfortable, are harmless for the most part. It all comes down to not-so-great circulation. "Cold fingers and toes are caused by constricted blood vessels to the skin. It's usually a normal physiological response to a cold environment, to help the body conserve heat," Lawie Beilin, Professor of Medicine at the University of Western Australia told The Huffington Post Australia. "Exercise to warm the body up as a whole. Wear bed socks at night. I won't suggest alcohol, but this will also open up the skin blood vessels," Professor Beilin said. We can't very well recommend you have a shot of whiskey to warm you up (but hey, if you're an adult, you make the call) and you can't always go for a jog around the block (though some yoga moves are said to improve circulation), so it looks like the easy answers are cosy socks, slippers and fun gloves. While mostly harmless, cold extremities can be linked to the use of some medications, so if that's the case you should discuss it with your doctor. "Occasionally, cold hands and feet can be a frequent and normal response to beta blocker medication, used to treat angina, high blood pressure or heart rhythm problems. It can also be a sign of hypothyroidism i.e an underactive thyroid gland. Some people have extreme skin vessel hypersensitivity to cold, known as Raynaud's phenomenon, which can be painful and require medical assessment. This can also be due to autoimmune problems," Professor Beilin said.